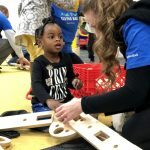 Tuesday, December 4th, Foundations Early Learning & Family Center revealed its new Rigamajig play system – granted by Morgan Stanley & the national non-profit KaBOOM! 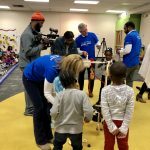 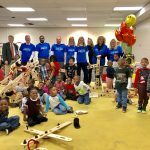 With 100+ children from Foundations, Tri-City & AMI in the Forest Hills Community Development Center in Fairfield, they welcomed the new STEM play system at the fun-filled event. 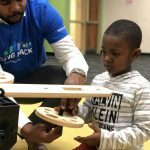 An interactive set of wooden planks, wheels and pulleys, Rigamajig allows children to develop language, communication and problem-solving skills that are key to cognitive development and STEM learning. 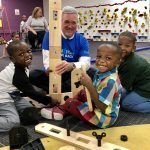 Rigamajig also provides a unique, engaging play opportunity for kids – the unstructured, child-directed play has proven to help children develop physically, emotionally, socially and intellectually, yet today’s kids have less time and fewer opportunities to play than any previous generation. 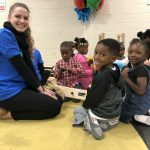 The grant is part of Morgan Stanley’s ongoing partnership with Foundations and their efforts to help provide children a healthy start for lifelong achievement and its commitment to being a strong, reliable partner to its local communities.